When I was but a young pup in the 5th grade, my teacher asked a question that prompted a reply that has forever haunted me as I grew up. “Who likes food?” was her question, and I was the only child who refused to raise my hand. To be fair, I was skin and bones back then. Family dinners consisted of everyone else sitting around the table, shoving pot roast and pork chops in their mouths while little me would take a bite, then run off to do cartwheels in the living room. Was food a top priority? Not at all. Oh, how things have changed. These days, all I can think about is when I get to eat again, and what tasty treats will best fit in my belly. Over the past few years, I’ve learned so much about quality food, that I practically can’t eat out at a restaurant unless it’s a local place and I know where their food is sourced, or if I happen to have an intense craving that makes me throw away all logic and go pig out. I’m looking at you, Asian cuisine! So when my friend Lynn took me to Watercourse Foods in Denver — a place known for its vegan-friendly menu — I knew I’d be in heaven. A quick scour of the menu proved me right. The entire menu made my mouth water, and despite my intense desire to try everything relating to Seitan, I was tempted instead by my ultimate vegetarian comfort food: crispy polenta served with a blue cheese cream sauce, wilted spinach in a lemon/caperberry/roasted cherry tomato sauce, and seared artichoke hearts. Swoon! I may be a loser, but I snapped pictures of the menu so I could work on recreating some of this food at home. You had better believe that Seitan buffalo wings, the country fried Seitan (with mashed potatoes, country gravy and green bean casserole — hello! 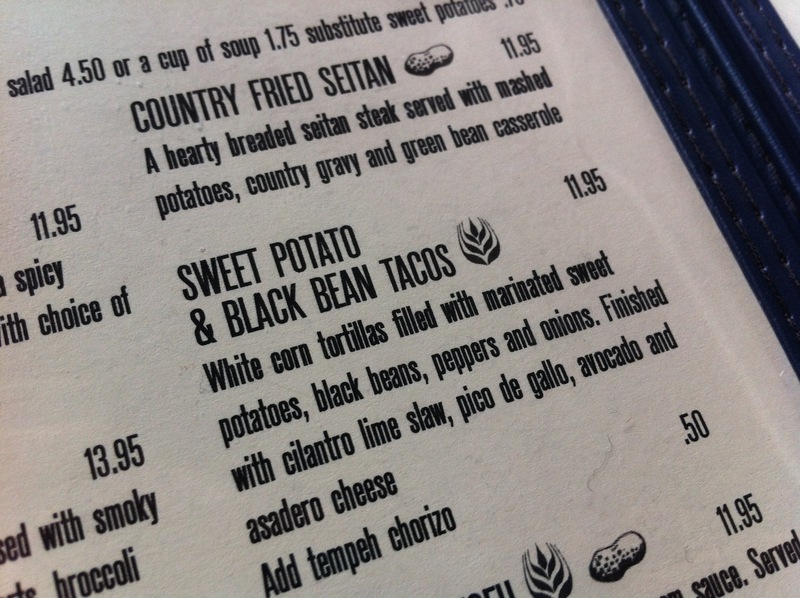 ), and the sweet potato and black bean tacos with tempeh chorizo will be on my menu at home very, very soon. I am happy that fifth grade me grew up into a foodie. And hey, maybe it was a sign early on that I just wasn’t cut out for pork chops and pot roast. I’m most definitely a kale, asparagus, and gourmet cheese kinda gal.